Suchero can help in the proper control and management of diabetes, weight management, and prevention of heart disease and obesity. 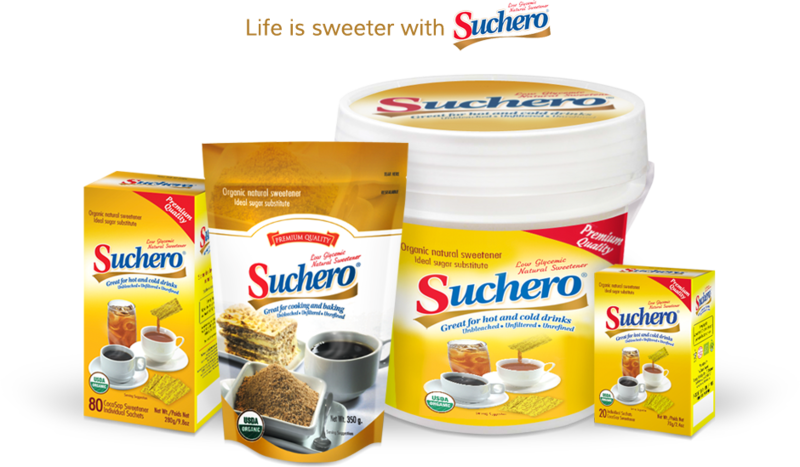 Suchero contains macro- and micronutrients such as Vitamin C, Calcium, Magnesium, Potassium and Zinc compared to other sugars. Suchero is classified as a low GI food, tested and confirmed in an Australian University. It’s an ideal sweetener substitute and can be safely used by diabetic patients or patients with high sugar level. The Glycemic Index (GI) is a ranking of carbohydrates on a scale from 0 to 100 according to the extent to which they raise blood sugar levels after digestion. High GI foods cause high or fluctuations in blood sugar levels while low GI foods causes gradual rises in blood sugar and insulin levels. Here are some of the most important of the 300 or so foods for which scientists have determined their glycemic indexes. The index uses white bread as the baseline with its index set as being equal to 100. The higher the index of a food the quicker it raises blood sugar level. Suchero, made of 100% carefully extracted organic coconut sap, has a glycemic index of between 35 and 55.